To experience this season, one has to leave the cozy comforts of one’s bed and set aside that blanket. These are a man’s greatest evils, especially in the early mornings. And it is indeed worthwhile to break the spell of sleep in the wee hours of Hemanta, to tread into silence of the forests only broken by the rhythmic rustle of dried leaves crumbling beneath the feet and intermittently by the song of the birds. In Hemanta the forests call you near with their subtle whisperings. In the undergrowth though, the footsteps of even the small Orange-headed Thrush are clear on the dry leaf bed. The thrush is well hidden into the dense thickets, picking up and smashing insects on the ground. The dense mountain slope facing the sun is woven by the maze-like branches of Karvy which continue onto the flat top of the hill. Beyond this hill we climb is a small valley with sparse human settlement. And beyond the valley is another mountain arm of the Kanheri range, beyond which rises the sun. The valley is settled into a thick fog which is only beginning to stir due to the warming air. The temperatures hover below 20 degrees. Come Shishir (January to March), the air starts to warm quickly and the deciduous trees completely shed their leaves. The forests, if not for secret watering holes, would be empty of any visible signs of life. In Vasant ritu (March to May) the humidity increases, trees flower, birds and butterflies come to life. During Grishma (May to July) the air gets heavier, thicker, and wetter. During Varsha and Sharad (July to September; and September to November, respectively), the air is in a transition from the dampness of the monsoon, to the intense humidity and warmth of October. If you have read through Ritusamraha of Hemanta, the allegory of love-making in this season goes in concert with the blossoming evergreen trees. And the buzzing of the bees committed to the act of pollination (entomophily) while at the same time gathering nectar and pollen to feed their young, is the epitome of this season. There’s nothing as beautiful as seeing – and understanding – the robe that is woven by many strings, each string a living being adorning our planet. One such string of the robe that we observed in Hemanta was that of trees, their surroundings, and life that depends upon them. A tall and handsome Ficus nervosa stood along a long-forgotten path in Matheran. This Ficus tree is ageless, for no one ever measured its birth date. From a seed tinier than the iris of our eye that came from one of the thousands of little figs produced by the mother tree, it has come a long, long way. This fig itself, from where came the seed, was pollinated by one of the very many tiny wasps called the Fig Wasps. A noted wasp that pollinates F. nervosa is Dolichoris sp. (Harrison and Rasplus, 2006) in south Asia (including India). The seed contained in a fig that was pollinated by a particular wasp was consumed by one of the residents of this jungle – either a Fruit Bat, a Hornbill, a Langur moneky, or the Giant Squirrel. And then it passed through the animal and fell to the ground many miles from the mother tree. On the ground it was likely picked up by the very least-expected animal – an ant. The ant, a worker, carried it in its underground nest, where the seed rested. With the first shower, and probably with the ant colony moved on (or perished), the seed sprouted a root, and then a shoot. And slowly it grew out of the softened mud of the ant colony of old. Ficus nervosa is a zoochorous evergreen tree. Zoochorous means its seeds are dispersed by animals, specifically mammals. The sapling grew unattended. The sun provided it the strength, and the earth water. And it grew for decades and decades, to form this mighty tree. This tree now continues the story of life it borrowed from its mother. And now, as then, Giant Squirrels and Langur monkeys dance in its boughs, Hornbill pick the figs, and it sees the changing world around it. Between these towering giants are meandering streams, some hidden in a veil of brown leaves, some containing watering holes in the deepest parts of its path. The water is calm, and nothing stirs except the inaudible cacophony of Water Striders. Yet look closely, for you will see that this watering hole has not been idle, or unused. Slowly as you are attuned to the sand, or mud along its banks, you will see movement that took place in the past – perhaps just a few minutes before you appeared from the forest. But I’m not large. The scale at which I am compared to the plethora of life and its wisdom in the forests is disproportionate. But the scale isn’t quite immeasurable. The cunning mind of man stands far taller than the ageless wisdom of a tree. Man has relied on plants more than he has relied on the very ground he lives upon. Even the most uncommon part of the plant, the resin, is collected ingeniously and applied to a variety of uses. Someone in the forests of Nagla Block kept a leaf as a collection plate for the resins dripping from over five meters up a tree. The source of the resin was natural – how or why would anyone want to do it so high up? The cheapest way was to let a leaf absorb the resins, which is used for a variety of functions from a gum-like substance to fix broken things to varnishes, or there maybe something we have not learnt of. The tribal communities that live around the forests also rely majorly on the forests for food and firewood. Under the Forest Rights Act of 2006, the forest dweller’s rights (those who reside in forests, or directly depend on forests since before 1980) to basic needs and livelihood is protected. This law came forth on what was the brink of war, unfortunately and ironically, between conservation and social security of the tribal communities of India. This act saw the light of the day after a large uproar (Read what is this act is about). We have always considered people and forests separate. That is what we have been taught since childhood: man does not belong to the forests. That the tangle of trees is not how a garden should look like, has been buried in our minds since we first laid our eyes on the prettily trimmed gardens. As you and I grew up, some of us learnt not to harm animals and plants. We learnt to dislike those who felled trees, without ever considering the need for doing so. And out of our ignorance we lived in our four walls. But little did we realize that the man who felled trees did so to cook food, to keep his family warm, and that he and his ancestors (in fact even ours) have done so for generations. Little did we realize this, simply because we were not taught about it in schools. On that day when I saw a family of four manage wood for the cold wave that has gripped the Konkan, I felt ashamed – not because our lives are different, but because I felt that the law has been unkind to some communities. With the Forest Rights Act in place, with all its wordy flaws, there is hope for forest dwellers after all, and with this we not only conserve their right to basic needs, but also conserve the traditional knowledge. The Katesavar tree, Bombax ceiba, is a common tree of the Indian forests. With the onset of Hemanta, the tree begins its blossom that lasts until Shishir and Vasant ritu. Little did you and I know until it was published online (pp. 3443-3446) that several tribal communities rely on the tree for its medicinal and culinary uses. 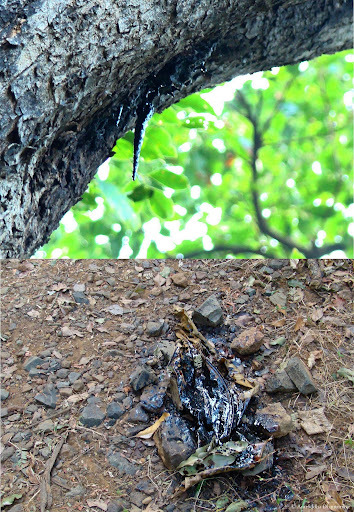 From its bark, the paste of which is used to heal wounds, to its flowers that are directly consumed, and its ovaries which are added to biryani for its various properties (as reported for the first time in this paper), are some of the least known ethnobotanical significance of this rather common tree of the forests. Yet man’s cunning is not limited to the sustainable, live-and-let-live kind of a way. 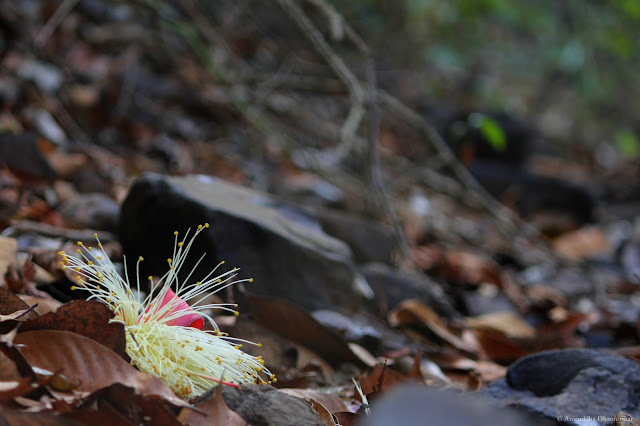 One of the problems facing the forests of Sahyadri is that of mining. In a country where large-scale mining goes completely unnoticed even when it is done illegally directly under the stark eye of the satellite, the small-scale mining operations are mostly undertaken under the very nose of the law. In Matheran, where the soil is a rich red, we noticed for the first time large manmade excavations. These were clearly for obtaining soil for reasons we could not find. With the ongoing rapid increase in settlements and hotels in Matheran, an “eco-sensitive zone”, it is not surprising that there is a demand for this red laterite soil which is used in making bricks. We believe this to be one of the major reasons for mining. The impact of this tunneling can be disastrous to the trees, but also to other life in case of heavy downpour. Since laterite soils do not absorb water, they easily wash away, creating gullies several meters deep. In digging of this soil, we’re also digging our own grave. Here we come to the fine line that divides forest rights with forest exploits. 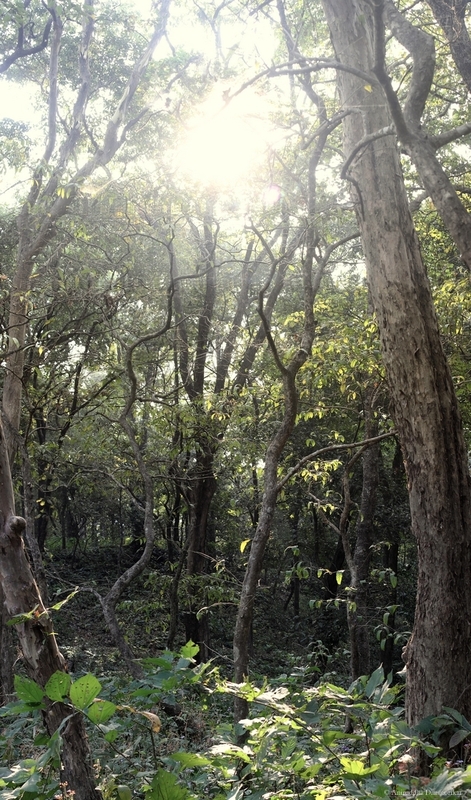 The Forest Rights Act was questioned by its opponents, stating that the rights to depend upon the forests under the act can wipe the forests off the face of the country. On the other hand, those who support this act stated that it will lead to community-driven conservation. From the way I see it, its greatest tool, which is also a bane, is that it vests power in tribal communities to protect the land, or mend it for worst. This is where we touch upon a problem of resource exploitation. The little mining incidence we observed at Mathern might be small, but it can have a compounded effect in the future. The trees that rest on top of the burrow are now fragile, their roots gripping onto air, and may collapse on the road trodden by many tourists. Who did this mining, and who will be responsible for the disaster, and who will be punished, will not be clear without regular patrolling by the Forest Department. The Department, we came to know, do patrol the forests, but are unaware of these activities. Unfortunately, the Department was one of the opponents of this Act, and hence pointing fingers at each other will be unavoidable, and the problem may remain unresolved. As we all get busier with our work this year, I hope we take out some time and trace the strings of life as far as they go. Only then will we realize that we’re not a figment of someone’s imagination, that a million species of our planet are no flakes of life lingering subconsciously in someone’s dream, but are existing, living, and surviving together, and that’s what makes our world appear to be a beautiful dream to our mind. I wish you all a very happy and a prosperous new year. It is indeed a very good article. Forest/nature is always beautiful in all seasons. The way and the rate at which we are utilizing these resources, plays vital role in conservation. As per my observation - The utilization of resources by the village family of four is much lesser than the family of four staying in the city. Gauri, thanks! I agree that the impacts of urbanization are more on the nature than the rural, and it is this urbanization that is majorly speeding resource utilization in the rural landscapes.